You can compare selected pair of stored procedures by selecting appropriate procedures in Source and Target database and clicking the button "Compare Sel. Proc". 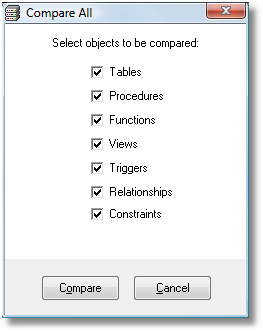 To compare all stored procedures at once click button "Compare All". Select the checkbox "Procedures" and click button "Compare". Alternatively you can click menu item Structure Comparisons | Bulk Comparisons, and then appropriate sub-menu - Simple or Details, depending on how much details you want to see in comparison report. At the end of the proces the report will be displayed. You can also perform selective comparisons, where only the stored procedures specified by you will be compared. To do so select menu item Structure Comparisons | Selective Comparisons and proceed the same way as with the Bulk Comparisons.